Every team faces some type of adversity, be it large or small, over the course of the season. That time comes earlier for some than others, and right now, the Tokyo Yakult Swallows are almost in the throes of tough times. While it’s still too early to panic, there is cause for concern. Injuries and pitching woes, those two things not being mutually exclusive, are threatening to undermine the Birds’ season before it really gets going, and unless manager Junji Ogawa finds a way to lift the malaise, fans might be in store for another long year at Jingu Stadium. Health issues have thinned the ranks on the mound for a second consecutive season. Shohei Tateyama missed all of 2013 with an elbow injury and will miss this year as well; Tony Barnette, a key member of the relief corps, is currently out with a knee injury; and injured fireballer Yoshinori Sato, who may have the most raw talent on the roster, hasn’t appeared in a regular-season game since 2011. Injuries are mostly outside of the team’s control, but the guys still in uniform haven’t delivered thus far either, as evidenced by Yakult’s bloated 6.06 ERA. That’s almost a full run higher than any of the other 11 NPB teams — the Hanshin Tigers come closest at 5.25. Yakult isn’t a club that will score tons of runs every game, so they’ll need quality production on the mound. Case in point, the team’s pitchers allowed 36 runs in six games last week, with the offense managing 25. Yakult went 2-4. Injuries have robbed the team of a few bats as well, and Lastings Milledge’s troubles at the plate have landed him on the farm team to make room for another pitcher, Orlando Roman, who the Swallows hope can provide a boost on the mound. Yakult scored 558 runs last year, and Waldimir Balentien had a hand in just under 20 percent of them. That was when he was setting records. If the offense takes a dip as he comes back to earth a little, it puts that much more importance on run prevention. 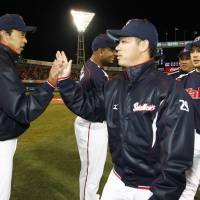 Whatever the right buttons are, the Swallows’ pitching coaches aren’t pushing them yet. The bright spot is right-hander Yasuhiro “Ryan” Ogawa, off to a 3-0 start with a 2.05 ERA in three games and looking like he’s ready to build upon last year’s 16-win campaign. What Yakult needs now is for the rest of the staff to step up around Ogawa. Ryohei Kiya is the only other Yakult hurler with a win as a starter after holding the Yokohama BayStars to a pair of runs over seven innings on Sunday. Taichi Ishiyama notched Yakult’s other win in relief. 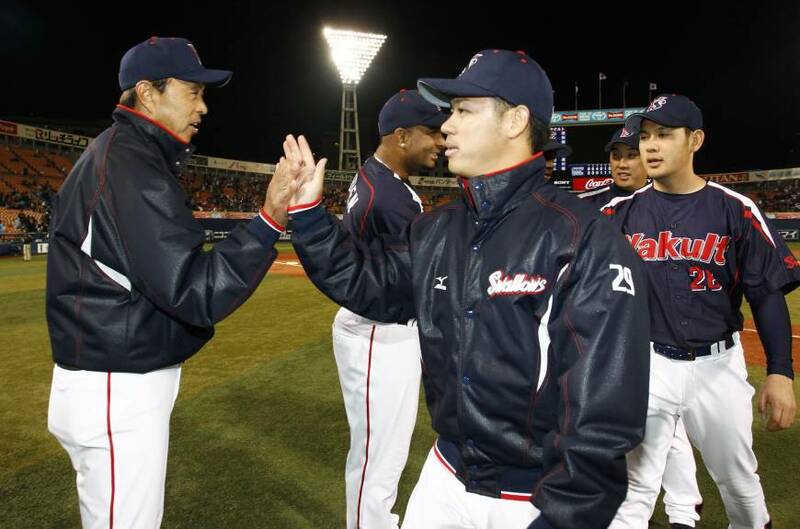 Veteran Masanori Ishikawa has the most experience, but he’s also allowed 16 runs — 14 earned — in 16⅔ innings. Ishikawa has had success in the past, and if any of the Swallows can get it turned around and lead by example, the right-hander should be able to do it. Beyond that, the team will need young and relatively inexperienced hurlers such as Ryo Akayoshi, Masato Furuno and Kiya to grow up fast and first-year foreign player Chris Narveson to get the lay of the land quickly. Sato’s return could be on the horizon as the calendar pushes toward summer, but it’s not a given he’s his old self after a two-year layoff, if he returns at all. The season is young and things are still far, far from being decided, but that doesn’t make the present any less crucial. Because if the Swallows, currently fifth, end up falling in too deep a hole now, there might not be enough time to fly out later.